There’s something about a nice procession that gets to me. I think it’s the physical act, which is communitive, of turning away from something and turning towards something else. Away from the everyday stuff and towards something more important that is often and too often neglected. 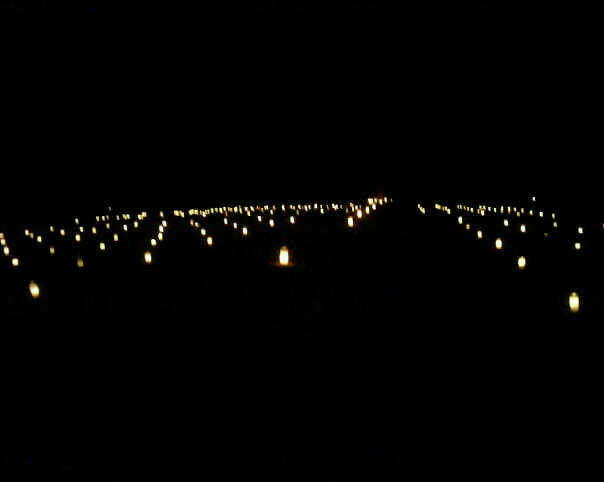 Last Sunday (I know, I’m just now getting around to posting it), we had a procession to the graveyard at St. Meinrad in the cold, dark night. It was simply profound. To remember for just one moment the number of monks who served this place, and the Church–well, it makes you shiver. The men whose remains are in this graveyard gave their very lives to the Church. We all carried a candle and placed it on a grave. No grave was left unlit. No one was left unremembered. The Vice Rector led us in the Litany of the Saints, which always brings me to a moment of inspiration, reflection, contemplation, and prayer. I love the saints because in them we find in those who have gone before us–all holy in different ways–lessons for us to learn, examples for us to follow. And they give us their prayers! These monks–they do the same. They show us what it means to give oneself to God, to His Church. And they give us their prayers. Their mark on the Church certainly remains. One priest along in years from the Arch. of Indy came to our diocesan prayer Monday. He said he spent some time that day in that graveyard remembering those monks who taught him over 30 years ago. This entry was posted in Prayer, Priesthood, Reflections, Retreats/Conferences. Bookmark the permalink.